South Korea’s foreign exchange reserves shrank for the first time in four months after the U.S dollar has strengthened against major currencies, lowering the value of non-dollar denominated foreign assets. According to Bank of Korea on Wednesday, Korea’s FX balance came to $404.67 billion as of the end of February, down $840 million from the previous month. It is the first on-month contraction after extending gains for three consecutive months since November. The fall was due to the stronger greenback against the major foreign currencies that has led to a decrease in the value of assets denominated in other foreign currencies when converted to U.S. dollar, according to the central bank. As of the end of February, the U.S dollar index gained 0.8 percent from a month earlier to 96.15, meaning that the dollar stayed stronger against world’s six major currencies. Against the U.S. dollar, euro was 1.0 percent weaker, Japanese yen down 1.7 percent, and Australian dollar 1.4 percent lower. By asset type, securities including government, public entity and corporate bonds and asset-backed securities shrank $1.14 billion on month to $379.1 billion. The special drawing rights (SDR) from the International Monetary Fund (IMF) decreased $10 million to $3.39 billion. SDR is an international reserve asset created by the IMF that can be withdrawn by its members in proportion to their quota in the IMF. 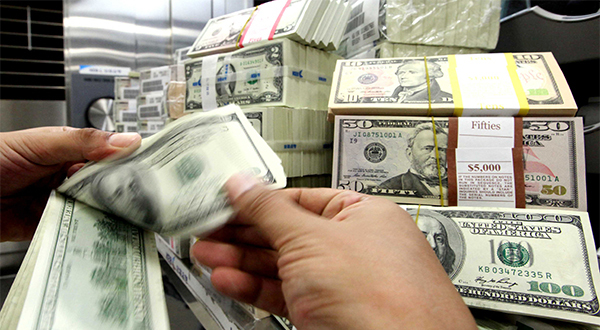 Cash deposits in foreign bank accounts rose by $310 million to $15.21 billion. The country’s reserve position with the IMF stood at $2.18 billion and gold reserve $4.79 billion, both unchanged from a month earlier. The country ranked as the eighth biggest holder of foreign exchange reserves as of the end of January. China was on the top with $3.88 trillion, followed by Japan with $1.28 trillion and Switzerland with $796.1 billion.